This IBM® Redpaper™ publication shows how the IBM Cloudant fully-managed database as a service (DaaS) enables applications and their developers to be more agile. As a part of its data layer, clients have access to multi-master replication and mobile device synchronization capabilities for occasionally connected devices. Applications can take advantage of Cloudant advance real-time indexing features for ad hoc full text search via Apache Lucene, online analytics via MapReduce, and advance geospatial querying. Mobile applications can use a durable replication protocol for offline sync and global data distribution, as well as a geo-load balancing capability to ensure cross-data center availability and optimal performance. The Cloudant RESTful web-based application programming interface (API), flexible schema, and capacity to scale massively are what empowers clients to deliver applications to market faster in a cost-effective, DBA-free service model. This Redpaper is the second in a series of IBM Redbooks publications on Cloudant. 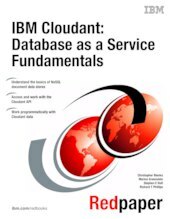 Be sure to read the others: IBM Cloudant: The Do-More NoSQL Data Layer, TIPS1187 and IBM Cloudant: Database-as-a-service Advanced Topics, REDP-5189.